As multi-instrumentalist, composer and bandleader Michael League has developed his craft, an informed political voice has concurrently emerged. Where once his assiduous nature manifested in the depth and detail of his compositions and arrangements, it now also guides the founding objectives of his new projects – such as the politically-engaged supergroup Bokanté. League, who leads the GRAMMY award-winning fusion powerhouse Snarky Puppy, formed the group in 2016 and their very make-up represents a positive statement about inclusion and cultural exchange. Bokanté features musicians hailing from five countries and four continents, each drawing upon unique skills and experiences to create an inviting, invigorating, sonically-and-culturally-aware sound. Guadeloupean vocalist Malika Tirolien delivers her urgent lyrics in Creole, Swedish percussionist André Ferrari calls upon the skills honed in traditional music group VÄSEN and South Florida-raised lap steel player Roosevelt Collier brings a church-rooted sensitivity and spirituality to the group dynamic. On 2018 album What Heat, the band worked with the Netherlands-based Metropole Orkest, expanding their sound in conjunction with the rising intensity of their message. League has been outspoken about the band’s desire to engage with important issues and ahead of their upcoming UK tour, which sees them playing in Manchester, Bristol and Leeds this month, expanded upon that. The articulate artist also discussed some of the music he’s currently enjoying and introduced one of the many lesser-known instruments that gave their last studio album its unique sonic stamp. Pick up tickets for Bokanté’s awe-inspiring live show here and read the interview with Michael League below. Bokanté formed with the intention of addressing socio-political subject matter, through music which blends sounds and ideas from various locations and cultures. Have events that have unfolded around the world since your formation reaffirmed the importance of what you’re doing? Have any particular issues taken on a greater significance in the group since you formed, and inspired any new or forthcoming music? How much does the diversity within the band influence the outcome of your music? Does the range in age and lived experience give a well-rounded perspective upon the subjects you’re addressing and the musical styles you’re drawing from? 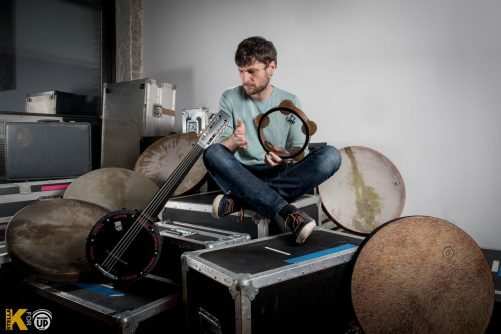 You used an incredible array of instruments to produce your new album, What Heat. Could you introduce us to one of the more unusual or uncommon instruments present on the record and tell us about the role it played, be that significant or relatively small? Following the European tour, you’ll convene with friends old and new at the GroundUP festival. Who are you looking forward to hearing and meeting over the weekend? ML: ‘I’m particularly excited to see a band that we first encountered while on tour in Colombia called ‘La Perla’. In the United States they are completely obscure – four female percussionists who also play gaita, a giant traditional woodwind instrument – and put on a show that I can only describe as spiritual. Is there anywhere Bokanté are yet to play that you’re desperate to visit? ML: ‘Yes! The Caribbean. So much of what we do (especially Malika) is the product of Caribbean influence and its spirit, and yet we’ve never been there! It’s one of the only places in the world that will understand the lyrics as Malika sings them. We’ve gotten so used to not being understood without explanation beforehand that I think it would really be interesting for the band, and especially for Malika, being back home’. You recently shared a fantastic list of records that you’re enjoying via All About Jazz, including works by Innov Gnawa and Kardes Türküler. Are there any others you would like to recommend? Pick up tickets for Bokanté’s awe-inspiring live show here.